An exhibition featuring the 21st century ledger art of Chris Pappan and Debra Yepa-Pappan, exploring the cultural identities of indigenous peoples in the Chicago area, and the idea of sacred space both past and present. FIRST PEOPLE, SECOND CITY will be launched with a day of lectures, artists talks, panel discussion & private view. More than half of the US Native American population live in and around cities. The contemporary inter-tribal culture of the city of Chicago influences and inspires artists Chris Pappan and Debra Yepa-Pappan in very different ways. In his ’21st century ledger art’ Chris Pappan summons characters from the past. 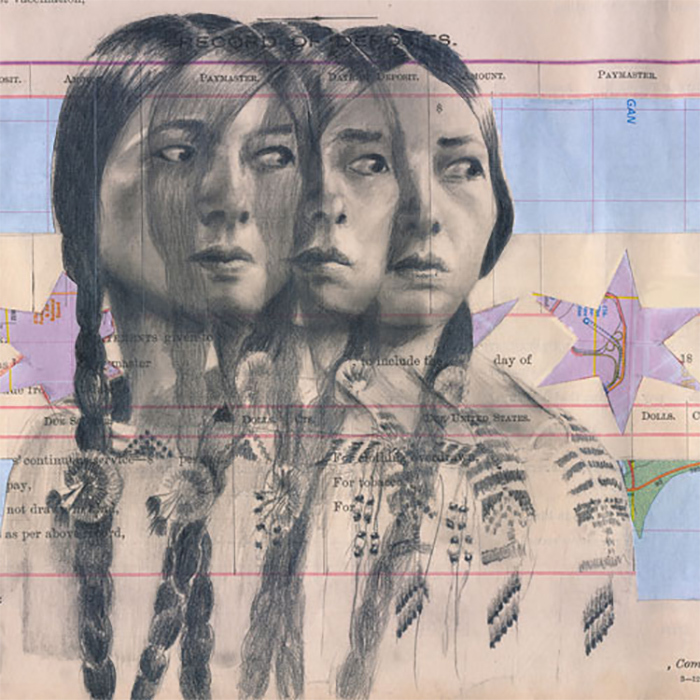 His compelling drawings re-stage historical photographic portraits against carefully chosen backgrounds, conveying politically charged messages about Native Americans’ socio-economic conditions, land rights, issues of cultural identity and their connections to historical events. Pappan’s skewed, reflected and distorted images challenge reality to reveal multifaceted appearances and guises. Pappan essentially asks us to go beyond the surface, to glimpse even for a moment, the complexities of the lived experience and to nurture a different kind of vision, one that resonates with indigenous views, spiritualities and philosophies. Chris Pappan’s work conveys with compelling strength an unbroken connection to the past and a clear message that Native American Indians are a present and active part of contemporary American culture. Debra Yepa-Pappan draws directly on her own family experience of growing up in Chicago with a Korean mother and Native American father. In digitally manipulated prints she layers repeated images of her daughter’s first traditional Jemez Pueblo ceremonial dance with decorative asian patterns, symbolic butterflies or dragonflies and Chicago urban scenery in ever more varied combinations. The results are confident, colourful, harmonious celebrations of her dual-identity. Each multilayered print has a sense of two halves in perfect balance with an inseparable cultural mix throughout. Whilst her husband’s work often calls on figures from the past, Debra frequently depicts the next generation carrying forward traditional dances as a natural and crucial part of todays society. FIRST PEOPLE, SECOND CITY is curated by Dr Max Carocci (BRITISH MUSEUM) and Joanne Prince (RAINMAKER).